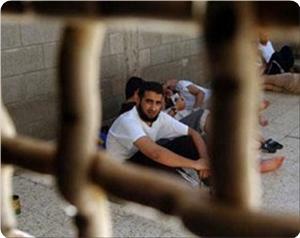 Ofer prison steps up repression as prisoners plan campaign of resistance. Home Campaigns Hunger Strike Solidarity Ofer prison steps up repression as prisoners plan campaign of resistance. The Palestinian Prisoners’ Club reported on Sunday, Septembe 2 that Ofer prison is currently in a high state of alert afte the appointment of a new prison director, Shlomo Jacob. In his first meeting with the prisoners, he demanded they stand in respect of him and his military rank, which prisoners refused to do. The prisoners refused to do so and made their refusal clear through their representatives. The prisoners’ representative was then transferred to another prison, and prison management is currently threatening the prisoners as a result, reported Ma’an. This comes amid a report by the Waed prisoners society that Palestinian prisoners in Israeli occupation jails have revealed a plan to escalate gradually protest steps against the prison administrations’ delay in implementing the “Dignity” agreement by which the prisoners ended their mass hunger strike in May 2012, as reported by the Palestine Information Centre. The Waed society for prisoners and ex-prisoners quoted those prisoners as saying that a month long “saving the strike” campaign would kick off soon that would include returning meals, not cooperating with the prison administrations, and others. They said that the protests would culminate with the start of a new hunger strike by 200 prisoners, adding that the number would then rise gradually. Waed warned of the continued deterioration in the conditions of those prisoners, calling for massive solidarity rallies to back up those prisoners’ demands and to expose the Israeli oppressive policy against them.